COVINGTON, Ky. — Sometimes even the smallest victims can find their voice. In the case of Mocha, an abandoned puppy that was discarded in a Dumpster at the Kenton County Animal Shelter last week, that voice was a persistent bark. And it saved her life. On June 2, as wind and rain pelted the Tri-State, Mocha was left to her own devices in the shelter’s Dumpster. No one knows how long she huddled there among the garbage, but around 3 a.m. her cries for help were answered by a Covington Police Department officer. Officer Joshua Haggard was parked outside the shelter when he heard Mocha’s bark from inside his police car, according to the after-hours report he left for shelter workers. When he got out and investigated the surrounding area, he found the small, light brown puppy fighting for her life inside the Dumpster. Haggard rescued the velvet-soft, pit bull mix puppy, and shelter employees were greeted Friday morning by a bright-eyed Mocha – with the officer's heart-wrenching report attached to her cage. If you’re picturing a broken-down puppy hiding in the corner, think again. Mocha’s tragic back story – and infectious positive outlook – quickly made her a favorite at the shelter, Gross said. A shelter worker even took her home overnight, and Mocha cuddled all night with her special needs dog that suffers from a neurological disorder. “She’s a really special puppy,” she said. After a mandatory five-day hold, Gross knew exactly who to call to help get the friendly puppy adopted: Darlene Williams, a volunteer for the Cold Spring based animal rescue, Stray Animal Adoption Program (SAAP). The Morning View mom of four fosters pit bull dogs exclusively and has helped find homes for 30 “pitties” since January. Williams said she felt an immediate connection to Mocha. That’s likely because she shares the abandoned dog’s resilience. The local mom lost her husband, Army Spc. Ronnie Williams, in 2005. He died a hero while serving the country in Iraq. Despite her loss, Williams has embraced life. She enjoys the everyday chaos that comes from raising kids and rescuing dogs, she said. Rescuing dogs is a family affair in the Williams house. Currently, they have a house full, including a few SAAP foster dogs. The youngest member the family, Williams’ 4-year-old daughter, Anaya, takes on much of the daily care of the family’s rescue dogs, she said. Gross said the shelter employees and volunteers all breathed a sigh of relief once they placed Mocha with the Williams clan, through SAAP. At the shelter, Anaya is known for her dedication to rescue dogs (and cute puppy shirts), she said. Pit bulls cannot be placed with families directly from the Kenton County Shelter, Gross said, and workers rely on local rescues to foster and ultimately find homes for them. Gross said everyone at the shelter is excited to see where Mocha will go from here. Have room in your family? SAAP is hosting an adoption event at Petco in Fort Wright this weekend. 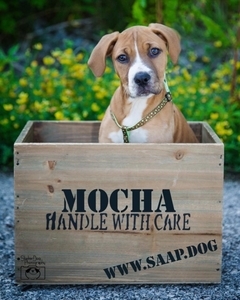 You can meet Mocha from 11 a.m.-3 p.m. both Saturday and Sunday. For details, visit the rescue’s website .